I’ve been using Twitter for a couple months and there’s a new contender in town called Plurk. Lots of blog writers have written articles comparing the features of both messaging systems but I wanted to take a new look into the two competitors. I want to analyze their statistical progression to evaluate their future popularity and success. Alexa Internet is a California company based in San Francisco founded in April 1996. It belongs to Amazon. Its Web site is mainly known for providing traffic statistics on the websites of the World Wide Web. My Blog and Podcast ranks 28,842. Visit Alexa here. The graph above shows the Alexa ranking of both Twitter and Plurk in the 6 last months. Twitter’s 3 month average is 950 and Plurk’s is 29,428. Obviously Twitter has a higher rank because people have been using twitter for a longer time and Twitter was the first web service to offer a messaging system. Twitter’s graph increases slowly while Plurk’s is all over the place. 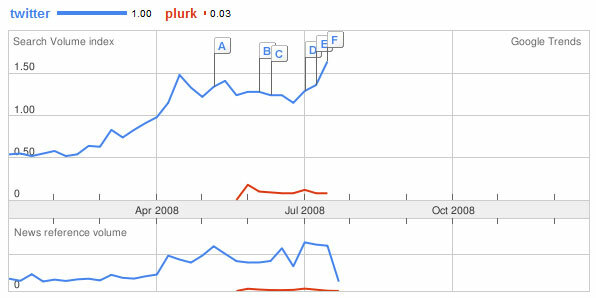 Plurk was very popular at first and then people lost interest but they started returning in June 2008. Now it looks like plurk’s audience has stabilized. I’m surprised it’s not increasing in july! From the data above, we see that Twitter’s global internet reach has increased by 53% in the last 3 months and it’s rank has increased by 584. 0.054% of all visits on the internet are to Twitter! That’s a lot! On the other hand, people are spending less time on twitter with a lower number of page views than 3 months ago. People are viewing an average of 5.72 pages per visit. 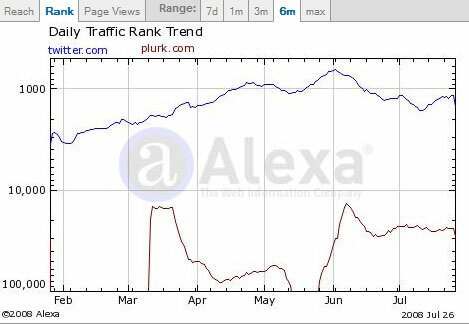 From the data above we see that Plurk’s traffic rank is increasing at a much faster pace than Twitter’s. 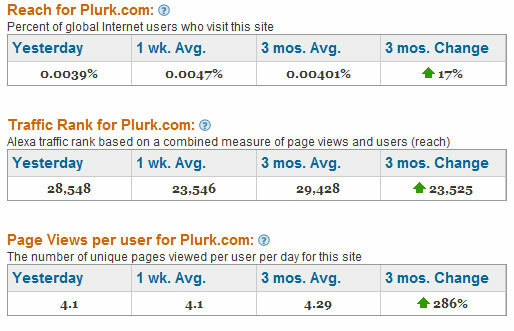 In the last 3 months, Plurk has gained 23,525 places in the Alexa rank system compared to 584 for Twitter. Plurk is growing fast! We also notice that Plurk’s number of page views per visit is lower than Twitter’s although it’s increasing much quicker, 286% increase in the last 3 months compared to -11% for Twitter. People are enjoying Plurk and are spending more and more time. Google Trends is a tool from Google Labs to see the frequency with which a term has been typed and searched in the Google search engine, with the ability to view the data by region and language. Presented in the form of a graph, the horizontal axis indicates the time scale year by year, starting in 2004, and the vertical axis shows the value of the frequency search term. The tool can also compare the frequency of several search terms. A feature by Google Trend is the presentation of news articles directly related to the peaks of popularity of keyword. Recently Google Trend has added data on the visitor traffic for most websites on the internet. Visit Google Trends Here. From the data above we see that a lot more people are searching for the keyword “twitter” than the keyword “plurk” in Google. Plurk seems to have stabilized while Twitter is increasing. Remember Twitter was launched before Plurk and has had a lot more press coverage so is far more notorious than Plurk. This seems to be exponential leaving Plurk far behind. I believe the name “Twitter” is more marketing friendly than “Plurk”. Both Twitter and Plurk have gotten some news coverage but Twitter has had far more and it seems it’s increasing since July. The data above is quite interesting. 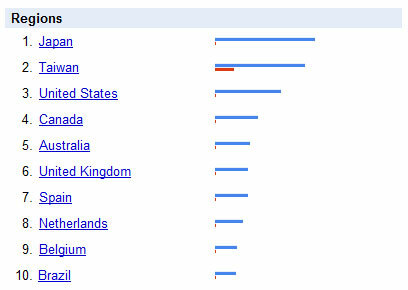 The top countries who search the keyword “Twitter” are in Asia with Japan and Taiwan. The main country that searches for Plurk is Taiwan. I’m surprised to see Canada with a population of only 30 million is 4th on the list! Way da Go! From the data above we see Twitter is steadily increasing its website traffic and has passed 400,000 daily unique visitors. Plurk on the other hand is having a hard time with a small increase followed by a sharp decrease in visitors. 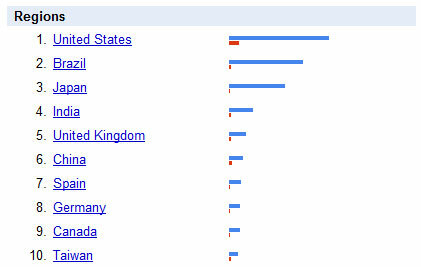 From the data above we see that the top 3 countries visiting Twitter are United States, Brazil followed by Japan. These 3 regions also represent more than 70% of the total visitors. United States, China and Taiwan are the top users of Plurk. I do not understand why the top visiting countries are not the same as the top countries searching for the keywords “twitter” or “plurk”. Do most users from USA and Brazil access the websites through their bookmark instead of searching for the link on Google? Seems a little strange… Any ideas? Trifecta measures the strength of pages, blogs and entire domains based on factors like popularity, influence and ranking ability. Trifecta counts the number of sites/pages that link to you, the number of times your brand is mentioned on the web and how much traffic your site receives. My Blog and Podcast has a final score of 24%. Visit Trifecta Here. I love this new tool called Trifecta by SEOmoz! It offers very complete information about any website or blog. You need to signup to have access to one report per day. Become a paying customer for unlimited reports. PageRank – Obviously Twitter has a much higher Google Page Rank than Plurk with 8 vs 3. DMOZ – Dmoz is a directory of websites maintained by Google. Getting a link from Dmoz means you have a great site and it boosts your credibility. For regular websites and blogs, Dmoz links are quite hard to get, I’ve submitted my link a couple times in the last 2 years. Twitter has 10 Dmoz links and Plurk doesn’t have any yet. I wouldn’t be surprised to see a couple Plurk links appear in the next 6 months. Google News – 338 articles written about Twitter and none for Plurk. Twitter was the site to introduce the messaging system onto the web. That’s a pretty big deal and I’m not surprised they have gotten so many articles written about their service. Maybe Plurk should already have a few articles, surprising! Google Blog Search Links – This data only counts links from blogs and does not count regular websites. I don’t know how Google decides what is a blog and what’s not. Maybe if there’s an RSS Feed? 59,548 blogs or posts have a link pointing to Twitter and 2,317 for Plurk, that’s 3,9% of the total links of Twitter! Ouch! It will be hard to catch up! But remember 2,317 links from great blogs is probably better than 59,548 links from crappy blogs! Google Domain Name Mentions – This data is quite interesting! This data represents the number of times the domain name appears on the web. The domain name does not have to point or have a link to the website. Just writing www.twitter.com in any text without linking to the website would count in this value. 73,000 domain name mentions for Twitter and 57,800 for Plurk! Wow! Plurk almost has as many as Twitter! That’s weird! Are people writing the url to Plurk without adding the link pointing towards the website? Compete Rank – Compete is a competitor to Alexa showing statistics just for United States usage. Twitter is ranked 791 and Plurk 5,276. Alexa Rank – Twitter is the 950th website in the world in terms of quantity of visitors worldwide. Plurk ranks at 29,428. The Plurk number should continue to increase for a while as Alexa averages the last 3 months and more and more visitors are joining Plurk. Yahoo Site Explorer Links To Domain – This tool includes all links towards a specific domain, including links with rel=”nofollow” which tells a search engines not to give any link love. 24,565,793 links are pointing to Twitter and 578,150 links towards Plurk. Plurk has 2,4% of the total links to Twitter. Big difference! Hard to catch up! Quantcast Rank – Quantcast is a competitor to Alexa. Twitter ranks at 2,115 and no data is available for Plurk, probably because the site is not old enough. Wikipedia Links – Everyone knows the great Wikipedia encyclopedia. Getting links from Wikipedia gives a lot of credibility to a website! Twitter has 50 links and Plurk has 8! 50 links is a lot! I’m impressed! I’m glad to see the small guy already has 8 Wikipedia Links! Technorati Blog Reactions – Technorati is a famous search engine and service website for blogs. Technorati counts the number of links pointing to any website from the blogs in their database. It’s similar to the Yahoo Site Explorer Links. Twitter has 3,486,444 blog reactions while Plurk has 13,770. Plurk has 0.39% of the number of links pointing towards Twitter! Wow! HUGE difference! Age In Days (First Google Cache) – This data checks when the Google bots first crawled the website. The results are most bizarre! Plurk’s cache is older than Twitter’s! What? How is this possible! Plurk is 1,271 days old (3 years and 6 months) and Twitter is 1,135 days old (3 years and 2 months). I guess the domain plurk.com was online previously but was not offering their current service. When I check the Internet Archive Wayback Machine, they do not have any results for Plurk.com! Twitter’s first page appears in March 2001. The Google cache archived Plurk but not the Wayback Machine! Weird! Any thoughts? Final Score – Twitter obviously wins with 82% while Plurk still gets 49%. Compete is a USA web traffic analysis service that publishes the number of US visitors to the top 1 million web sites in the USA. This number is computed from sources like internet service providers, opt-in panels, application providers, and users of the Compete toolbar. My Blog and Podcast ranks at 18,140. Visit Compete Here. From the graph above we see that Plurk has only started getting some traffic starting March 2008. The Twitter curve seems to be nicely increasing while the Plurk graph is also augmenting since May 2008. According to Compete, Twitter gets 1.75 million U.S. visitors in June 2008. Only for America! That’s 58,333 unique visitors daily. Not bad! If my calculations are correct, Plurk gets an average of 13,333 unique U.S. visitors daily in June 2008. 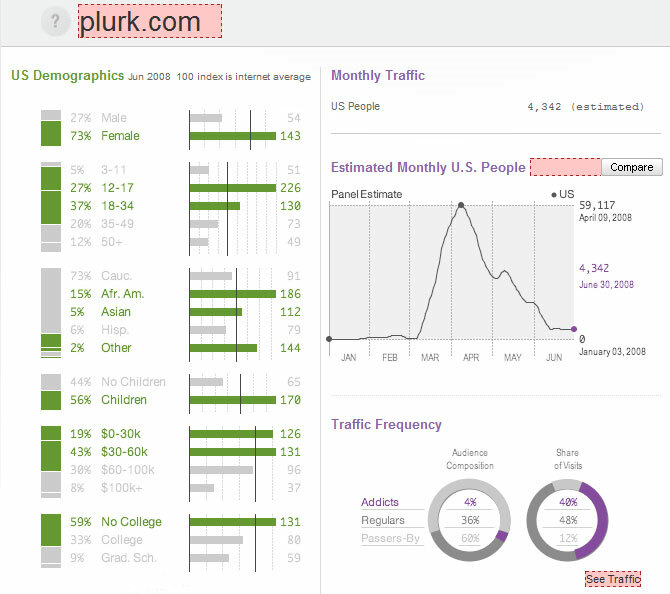 Plurk gets 22,8% of the traffic going to Twitter. Five times more visitors on Twitter. The graph above is most interesting! How is the popularity of both sites increasing? What is the velocity at which both site’s traffic is increasing? Overall I would say Plurk is winning (see the red bars on the graph) but Twitter is putting up a fight and has been surpassing Plurk at the end of July. Twitter is gaining momentum! Plurk’s growth was at its highest during the two first weeks of July. More users were signing up on Plurk than on Twitter. Remember this is for USA alone! The graph above is also quite interesting. This is the number of pages viewed per visit. The more pages per visit, the more time a user is spending on the website. If a website is really interesting, you’ll want to spend more time on it! Twitter has been winning the battle all the way until June 2008. Huge increase in pageviews for Plurk between May and June! Wow! This means that more and more users are getting addicted to Plurk. 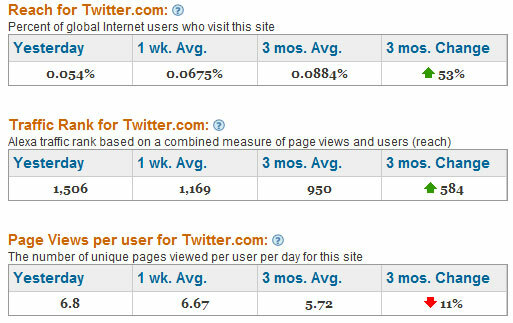 Overall, users visit an average of 7-8 pages per visit on Plurk and Twitter. That’s a lot! On my Blog it’s 1.6 pageviews per visit! Remember this is for USA alone! If we compare the pageviews from Compete and Alexa, we see a big differences. Alexa’s data is much lower : 5,72 pageviews for Twitter and 4,29 pageviews for Plurk! That’s 20% less than the compete data! Quantcast is a service Website that allows viewing statistics from other Web sites. Quantcast Corporation’s prime focus is to analyze the Internet’s Web sites in order to obtain accurate statistics. My Blog and Podcast ranks 13,391. Visit Quantcast Here. The data on the graph above is amazing! It shows that Plurk’s traffic is increasing at a much quicker rate than Twitter’s! 25,000% increase in february 2008! Twitter’s relative traffic is extremely stable compared to Plurk’s. Since May 2008, Plurk’s relative traffic has been exponentialy increasing. Plurk definately wins the battle from this data! The graph above is the third traffic comparison chart for Twitter vs Plurk. You have seen Google Trends’s and Compete’s now Quantcast. The result is the same as before, Twitter has a lot more visitors than Plurk. From the data above we see that as many men as women visit Twitter. I would have thought that the top users were 12-17 years old but it is not the case! Most users are between 18 and 49 years old! 82% are white caucasian. 72% of visitors do not have children, ok. The salaries of Twitter users are relatively high! 23% of people earn more than $100K a year! Wow! Members are also educated with 18% to have gone to Graduate School. Remember this data is for USA alone! 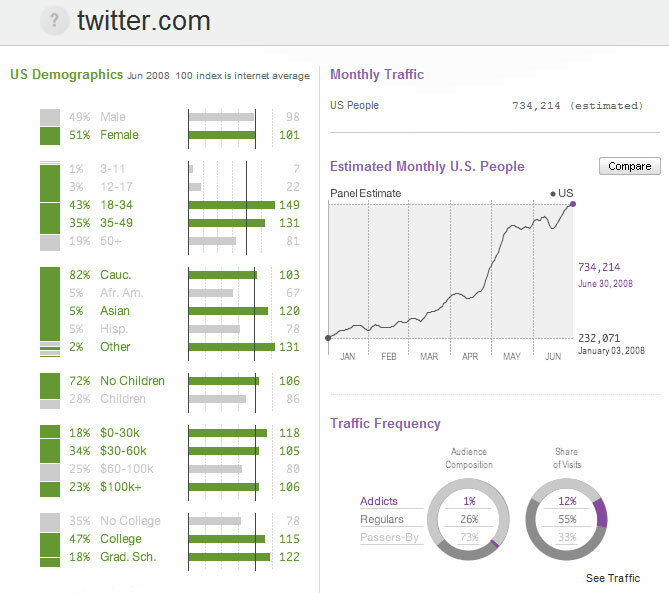 On the data above with see very different demographic figures than with Twitter. The audiences on both sites are quite different! 73% of Plurk’s users are female. 12 to 17 year olds represent 27% of the user base. 15% are African Americans followed by Asians. 56% of the visitors have children! The users make less money than Twitter users with 19% making $0-30K. Most Plurk users have not been to College with 59%. The estimated monthly users for Plurk are drastically decreasing according to Quantcast! People seem to be much more addicted to Plurk than Twitter. Plurk has 4% addicts and 36% regular users while Twitter has 1% addicts and 26% regular users. Remember this data is for USA alone! I’m surprised the demographic statistics are so different between Twitter and Plurk! The first two statistics might say a lot about the future of the two competitors. Are people using Plurk having a better user experience than on Twitter? It seems to be the case. Ultimately, I believe internet users always want to use the “better product” (like people switching to gmail) and according to the many blog posts comparing both services, Plurk offers a better service and user experience. Twitter needs to stay alert! They should improve their service by adding new features and making sure the servers can handle the huge amounts of traffic! People have complained a lot about the site being down. If they don’t react, it’s possible the users will switch to Plurk and within a few years Plurk could surpass Twitter. This probably is an unlikely scenario because of Twitter’s current leading position, they got on the market first and also because of the strong momentum Twitter has gained thanks to the huge press coverage! But messages can spread very quickly now thanks to internet. If Twitter went down for a week, it would die. Your comments and remarks are welcome, please insert them in the comment area below. Signup to my Internet RSS Feed — Visit my Internet articles category — Follow me on Twitter!